Located outside McArthur Glen Outlet in Serravalle Scrivia, Italy, Ferrari Factory Store is the first building in the Ferrari Stores’ history designed to accomodate an entire store. The 370 sqm building is designed and developed by Iosa Ghini Associates, who made a magnificent work both in exterior and interior. 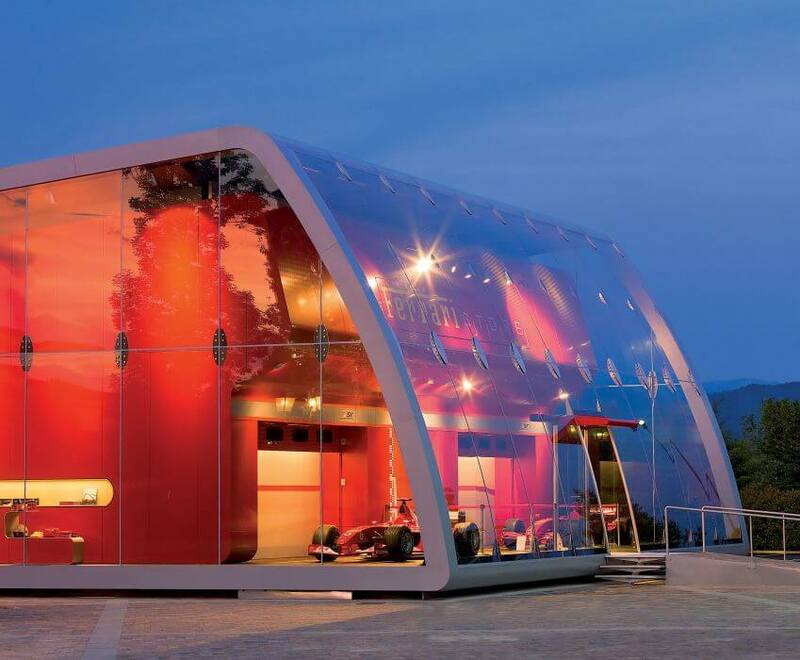 You just need to take a look even from a long distance and immediately identify the building with a Ferrari space due to its highly innovative glass with a curved face without mounting posts and bars that permit total visibility inward and outward. Through this full glass facade you can see the interior wall which is dominated by the intense red color, specific to Ferrari’s brand. The new outlet breathes the philosophy and passion typical of Ferrari through both is fantastic interior design and its marvelous creations that are displayed once you enter the building: two types of F1 Ferrari which became a symbol of speed over time. The Ferrari Store submit articles of high quality and high aesthetic value at reduced prices. It summarizes in its collections the excellence of the cars that are famous around the world, combined with attention to the welfare of the people to whom it applies. With its unique graphic style, the overall architectural design of the space manages to capture all senses, being a physical and iconographic interpretation that wants to transmit an engaging idea about luxurious car brand.